Anyone riding the subway in Washington DC in the United States who believes that the service for their new or old cell phone has improved of late is not imagining things, according to transit officials. Four nationwide carriers, AT&T, Sprint, T-Mobile and Verizon, have been working “every night and through the weekends” to install equipment and fiber, according to Dan Stessel, the chief spokesman for Metro. “On any given night, there may be as many as six or seven separate job sites on the system,” he says. Metro has long had a contract with Verizon for providing service in the subway system, but as a result of a deal for federal funding in capital improvements made with Congress three years ago back in 2008, the service was required to be expanded, with wireless needing to be available throughout the entirety of the transit system by the 16th of October next year. Metro is “working toward that goal”, Stessel adds. The top 20 busiest stations in the region’s Metro system are now online thanks to the four carriers, including Ballston, Union Station, Bethesda, Smithsonian and Columbia Heights. 39 stations above ground in the rail system are also being upgraded to have fiber-optic lines installed, work which is now around 50 percent complete. 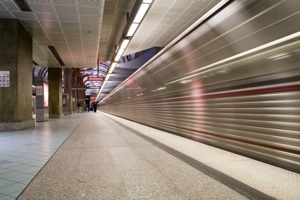 “We want to provide customers with the ability to use cell phones and wireless devices throughout the Metro rail system using the carrier of their choice,” Stessel adds.